A recent review of the state aid supported roll-out of “superfast broadband” services in East Sussex (e-Sussex) has triggered a row between Conservative and opposition Liberal Democrat councillors, which focuses upon whether or not the project ever “promised” to deliver 100% coverage. Officially the original £34m+ e-Sussex contract, which was agreed with Openreach (BT), pledged to make “fibre broadband” (FTTC/P/Cable etc.) services available to 99% of local premises in the county (96% will get “superfast” speeds of 24Mbps+), which was allegedly completed in March 2017 (here). 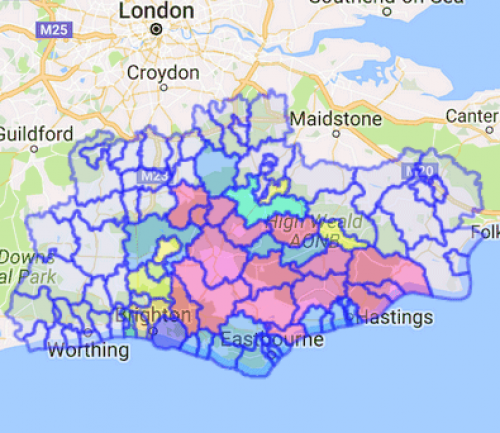 The latest independent estimates from Thinkbroadband’s database suggest that 99% of premises in East Sussex are indeed covered by “fibre broadband,” although the figure drops to about 94% when looking at speeds of 24Mbps+ (rises to 95.7% if you include the city of Brighton). On top of that a second Superfast Extension Programme (SEP) contract was agreed all the way back in 2015 (here), which should add another 7,000 premises to the total and this is due to complete by December 2017. A third contract is now being debated that will go even further. • Contract 1 (signed in May 2013) to deliver a 3 year programme of infrastructure improvements funded by ESCC £15m, Broadband Delivery UK [BDUK] £10.64m and BT £4.4m. • Contract 2 (signed in June 2015) to deliver an infrastructure programme to provide superfast broadband coverage to a further 5,000 premises (recently increased to 7,000). The work related to this contract is taking place during 2016 and 2017, and is funded by ESCC £3m (re-invested from the first contract), BDUK £3m and BT £265,000. However Kathryn Field, the LibDem councillor for Battle and Crowhurst, has criticised a new Scrutiny Report that was tasked with examining the first contract because she claims that ESCC had promised to deliver 100% coverage of superfast broadband (here), which so far has not been achieved. Kathryn’s view has also been echoed by other local LibDem councillors. “The very last recommendation talks about creating a fact sheet to address misconceptions. The only misconception that needs addressing is the promise and it was a promise, it was not a ‘we will try our best’, it was a promise by Councillor Jones that every single household in this county would be enabled to receive superfast broadband. In fairness the local authority deserves some of the blame for this confusion because they often used the tedious “fibre broadband” terminology to explain their aspirations and this usually gets jumbled together with the term “superfast” (24Mbps+). Crucially hybrid-fibre services, such as Openreach’s favoured Fibre-to-the-Cabinet (FTTC) technology, will in some areas deliver much slower speeds than 24Mbps (i.e. hence the difference between the 99% and 96% figures at the start of our article). “Let’s be absolutely clear, when Councillor Jones made promises all those years ago he was absolutely convinced what he was saying was going to be true, but actually the world changes. The ability to deliver, as has been explained earlier, was not simple and straightforward. Let’s move on. At the end of the day I have been leader for four years. Councillor Jones has not been a councillor for four years. The above remarks were also echoed by another Conservative councillor, Rupert Simmons, who noted that the local authority “do intend to get as close to 100 per cent as physically possible.” In fairness East Sussex currently has better coverage of superfast broadband than a lot of local authorities, although there’s clearly room for improvement, both in terms of how such progress is communicated and with regards to future network coverage. The report itself also notes feedback from some of those who have been covered by the service, which found some all too familiar concerns. • In a number of cases, provision of information concerning the timing and availability of superfast broadband has been poor and precise information about when or whether superfast broadband will be provided to particular premises is not available. The good news is that Openreach are expected to deploy more FTTP as part of Contract 2, which delivers much more reliable ultrafast speeds. Unfortunately the review doesn’t tell us anything new about the plans for Contract 3, which will focus on reaching at least some of the the c.20,000 premises that cannot currently receive a superfast service. However we do learn that Contract 3 will prioritise those that are experiencing speeds less than 15Mbps and the service provision to any remaining business parks (the latter is difficult and so far the team has only identified two such parks). Likewise the council confirms that “there may be a minority of premises, at the end of the project, which will be unable to access superfast broadband” and extra funding is expected to be set aside for these in order to help them find an alternative (e.g. satellite, mobile, fixed wireless etc.). Here’s a full list of all the recommendations. c. Make it easier for residents and businesses to check for themselves the broadband coverage and the speed they can receive. 2. Details of coverage, including maps, are published at the end of Contract 2 and further information is provided to explain how and why finite funding levels may prevent the project from enabling superfast broadband access for some harder to reach premises. 3. Information is provided at the earliest opportunity outlining those premises that may not be ‘connected’ to superfast broadband and that the survey results are made available to communities and smaller suppliers to encourage the development of alternative delivery methods. 4. Once the total cost of providing superfast broadband to the remaining premises is known (or can be estimated), the Broadband Team clarifies how those premises receiving the slowest speeds will be prioritised in the context of the remaining available budget. 5. When, and if necessary, a ‘community match’ type funding programme is established for communities to bid into to pay for community based broadband schemes, in order to provide access for some of the hardest to reach premises not covered by the project, and a ‘toolkit’ is developed for communities who wish to implement their own broadband schemes. 6. Councillors, business organisations, and Parish Councils are encouraged to contact the Broadband Team with details of any Business Parks that do not have access to superfast broadband, so they can be included the in the project rollout. 7. Lessons are learnt about the management of expectations when embarking upon complex projects of this nature, and to avoid “hype” at the outset, so that there is a careful distinction between the actual projected outcomes and aspirations or vision statements. c. A fact sheet created to address misconceptions about the Broadband Project and some of the frequently asked questions. Have you located anything on who paid what for how many cabinets installed? I couldn’t find any detailed costings in their report but you can check yourself as there are several related documents. NOthing specific in that bunch and yet there is 20,000 premises left for phase 3. This is what happens when comments made by politicians do not match the targets specified in contracts. Anything not contracted is at best an aspiration. Based on the TBB data, coverage is pretty good though, does appear to be consistent with the contractual targets when Brighton is included. The comments were made prior to the contract being signed or even tendered for. Like a lot of councils there was an expectation in 2010/11 that improving broadband everywhere was the aim, only to have BDUK shoot that down with their lack of ambition and decision to leave 5% in the dark ages. Contracts say the money goes as far as possible and BT is now sitting on a £446m capital deferral. How long does this rest in BT’s accounts before the 20,000 excluded get an upgrade. Given the scale of the funding why exclude them from the planning process? When do we see a list of who paid for what? It is good, but it is because it is good that given the funding so much more is possible. You do realise that the £446 million figure is immaterial to the East Sussex BDUK programme and that it can only re-invest whatever funds are attributable to that project by operation of the gain-share process? Without knowing exactly how much that is, you can’t possibly know if the funds will stretch to all 20,000 premises. Given that (according to TBB) there are only an average of 40 lines per phase 2 BDUK cabinet as they use “fill-ins”, that means a higher proportion in the future will be FTTP which puts up costs per premises. I’m sure there are several millions available, maybe as much £10m including a bit of underspend (doing a very, very rough and ready calculation). But we will have to aait whatever is announced for phase 3.
nb. I seem to recall reading phase 2 isn’t complete yet, so that will presumably pick up some of the 20,000. @Steve, I am glad you agree that there should be as much as £10m available. Phase 1 was c350 cabs with lots of in-fill in places like East Grinstead so the BT communicated cost of £26k is less than £10m before BT’s capital contribution. Clawback per 100k in the intervention area is now close to £10m, so I do not understand why this is not made clear in the meeting or in the notes. The BT capital is not yet transparent in the process. I need to salute BT for c840 commercial cabs on this patch. You are misrepresenting what I wrote. I said that there may be as much as £10m available, absolutely nowhere did I say that there “should be”, a rather different thing. It will be the local BDUK project that will have the figures which, in any event, are always subject to change according to take-up and how phase 2 is proceeding and what cost savings may, or may not have been achieved. As an example, the Northumberland Phase 3 project had £4.4m returned by BT to which has been added £1m of council money and £1m of BT. The Northumberland project costs for the phase 3 extension are of the order of £2k pre premises to be passed (all in). Northumberland is, of course, rather more thinly populated than East Sussex, but it might give some hint about the way coverage costs are going as you get into that last 5%. > simple and straightforward. Let’s move on. “We didn’t know what we were talking about, and it’s all your fault for believing us. Now please stop wasting my time with your questions”. Just remember that next time they’re up for election! The budgets remain or should remain to do most of what is required. The published proceeedings have no numbers. Are they available elsewhere?